The word anaerobic indicates "without oxygen." The term has many uses in medicine. Anaerobic bacteria are germs that can survive and grow where there is no oxygen. 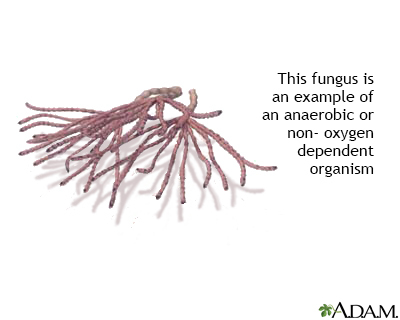 For example, it can thrive in human tissue that is injured and does not have oxygen-rich blood flowing to it. Infections like tetanus and gangrene are caused by anaerobic bacteria. Anaerobic infections typically cause abscesses (buildups of pus), and death of tissue. Many anaerobic bacteria produce enzymes that destroy tissue or sometimes release potent toxins. Besides bacteria, some protozoans and worms are also anaerobic. Illnesses that create a lack of oxygen in the body can force the body into anaerobic activity. This can cause harmful chemicals to form. It can happen in all types of shock. Anaerobic is the opposite of aerobic. In exercise, our bodies need to perform both anaerobic and aerobic reactions to supply us with energy. We need aerobic reactions for slower and more prolonged exercise like walking or jogging. Anaerobic reactions are faster. We need them during shorter, more intense activities like sprinting. Anaerobic exercise leads to a buildup of lactic acid in our tissues. We need oxygen to remove the lactic acid. When sprinters breathe heavily after running a race, they are removing the lactic acid by providing oxygen to their bodies. Asplund CA, Best TM. Exercise physiology. In: Miller MD, Thompson SR. eds. DeLee and Drez's Orthopaedic Sports Medicine. 4th ed. Philadelphia, PA: Elsevier Saunders; 2015:chap 7. Cohen-Poradosu R, Kasper DL. Anaerobic infections: general concepts. In: Bennett JE, Dolin R, Blaser MJ, eds. Mandell, Douglas, and Bennett's Principles and Practice of Infectious Diseases. Updated edition. 8th ed. Philadelphia, PA: Elsevier Saunders; 2015:chap 244. Some fungi are able to survive, grow, and function in environments without oxygen.